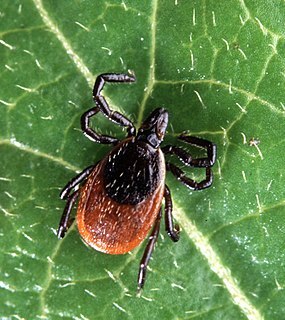 Tick-borne diseases, which afflict humans and other animals, are caused by infectious agents transmitted by tick bites. Tick-borne illnesses are caused by infection with a variety of pathogens, including rickettsia and other types of bacteria, viruses, and protozoa. Because individual ticks can harbor more than one disease-causing agent, patients can be infected with more than one pathogen at the same time, compounding the difficulty in diagnosis and treatment. As of 2016, 16 tick-borne diseases of humans are known (four discovered since 2013). As the incidence of tick-borne illnesses increases and the geographic areas in which they are found expand, health workers increasingly must be able to distinguish the diverse, and often overlapping, clinical presentations of these diseases. In general, specific laboratory tests are not available to rapidly diagnose tick-borne diseases. 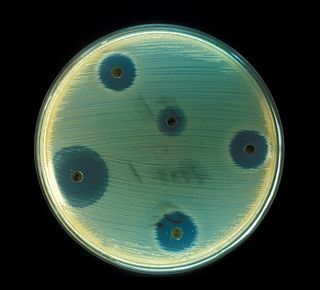 Due to their seriousness, antibiotic treatment is often justified based on clinical presentation alone. The University of Massachusetts is the five-campus public university system and the only public research system in the Commonwealth of Massachusetts. The University system includes five campuses, and a satellite campus, with system administration in Boston and Shrewsbury. The system is accredited by the New England Association of Schools and Colleges and across its campuses enrolls 73,000 students. Region (Brazil): São Paulo, Rio de Janeiro, Minas Gerais. Andrew Spielman, Sc.D. was a prominent American public health entomologist and Professor of Tropical Public Health in the Department of Immunology and Infectious Disease at the Harvard School of Public Health (HSPH). Jorge Benach is a medical researcher at the Stony Brook University in New York state. Benach is the chair of the Department of Molecular Genetics and Microbiology. Benach's main area of research is the tick-borne spirochete Borrelia burgdorferi which is the causative agent of Lyme disease. The Baggio–Yoshinari syndrome, formerly known as the Brazilian Lyme-like disease and Brazilian human borreliosis, is a disease transmitted by the Amblyomma cajennense tick, but the organism that causes the infection is still unknown. Clinical features resemble those of Lyme disease (LD). Tibovirus Is term is often used to describe viruses that are transmitted by tick vectors. The word tibovirus is an acronym. This falls within the superorder arthropod thus tibovirus is classified under Arthropod Borne virus (Arborvirus). 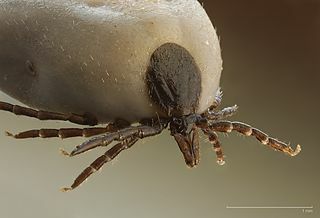 For a person to acquire infection the tick must bite and feed for a sufficient period of time. The tiboviruses that affect humans are limited to within 3 families: Flaviviridae, Reoviridae, and Bunyaviridae. Borrelia mayonii is a gram-negative, host-associated spirochete that is capable of causing Lyme disease. This organism can infect various vertebrate and invertebrate hosts such as humans and ticks, primarily Ixodes scapularis. Migratory songbirds play a role in the dispersal of the tick vector, Ixodes scapularis, across long distances, indirectly dispersing Borrelia mayonii as well. ↑ "Tick-Borne Diseases". cdc.gov. Centers for Disease Control and Prevention: National Institute for Occupational Safety and Health . Retrieved May 21, 2009. ↑ Rahlenbeck, Sibylle; Fingerle, Volker; Doggett, Stephen (2016-09-01). "Prevention of tick-borne diseases: an overview". Br J Gen Pract. 66 (650): 492–494. doi:10.3399/bjgp16X687013. ISSN 0960-1643. PMID 27563139. ↑ "Tick-Encounter" . Retrieved June 19, 2015. ↑ Mayo Clinic Staff. "Lyme disease: Symptoms". MayoClinic.com. Diseases and Conditions. Mayo Clinic. ↑ Mayo Clinic Staff. "Lyme disease: Treatments and drugs". MayoClinic.com. Diseases and Conditions. Mayo Clinic. ↑ Relapsing fever at eMedicine. ↑ Relapsing fever~treatment at eMedicine. 1 2 3 4 Lindblom, A; Wallménius, K; Nordberg, M; Forsberg, P; et al. (2012). "Seroreactivity for spotted fever rickettsiae and co-infections with other tick-borne agents among habitants (sic) in central and southern Sweden". European Journal of Clinical Microbiology & Infectious Diseases . 32 (3): 317–23. doi:10.1007/s10096-012-1742-3. PMC 3569577   . PMID 22961007. ↑ Dobler, Gerhard (2010-01-27). "Zoonotic tick-borne flaviviruses". Veterinary Microbiology. Zoonoses: Advances and Perspectives. 140 (3–4): 221–228. doi:10.1016/j.vetmic.2009.08.024. ↑ "Powassan Virus | Powassan | CDC". www.cdc.gov. Retrieved 2017-06-07. ↑ Pastula, DM; Turabelidze, G; Yates, KF; Jones, TF; et al. (March 2014). "Notes from the field: Heartland virus disease - United States, 2012-2013". Morbidity and Mortality Weekly Report . 63 (12): 270–1. PMID 24670929. ↑ "Ticks". medent.usyd.edu.au. Department of Entomology, University of Sydney and Westmead Hospital. November 7, 2003.